The news revolves around the 7 year shelf life of Aeroplan miles that the company announced in late 2006 and became effective January 1, 2007. Basically what this means is that any miles earned prior to January 1, 2007 will expire on January 1, 2014. Miles earned after January 1, 2007 will expire at the end of the month they were earned in seven years later. So if you are still collecting and redeeming miles with Aeroplan then you still have some time to start worrying about losing those miles prior to 2007. The reason this news is surfacing now is that Aeroplan is slowly getting to work on systems to notify members on when their miles will expire starting in 2014 on a monthly basis and word is it that it will be started sometime in 2011. This is a separate rule then the one that has made the news the past few years and that is the inactivity rule whereby if you do not earn or redeem at least 1 Aeroplan mile every 12 months then you lose all your miles regardless of how long you have had them. Many members have complained about this rule and not being notified about it. Aeroplan states they make all attempts to notify its members but the communications may get lost in all the emails received from Aeroplan. One question posed to me is when you redeem miles which go first? Aeroplan runs on a first in first out basis which means your oldest miles are redeemed first on any Aeroplan redemption. Other criticisms I have seen and been noted of is why is Aeroplan doing this but truth be told they were not the first frequent flyer program to do this and in fact their Canadian competitor, WestJet, has a 5 year shelf life for their WestJet dolllars earned in the WestJet Frequent Guest Program. Please feel free to pose any questions, comments or concerns below. Marriott heralded an industry first this past year when they introduced Elite Rollover nights that essentially allowed you to keep any extra nights over and above your latest elite level and use them towards your elite status for the following year. Earlier this week Marriott was please to announce via their Marriott Rewards Insiders forum that will continue to offer this great feature for the 2011 year. This means that any extra nights you have at the end of 2011 will count towards your requalification in 2012. US Airways has introduced a million miler program (much like Air Canada did recently) where they will offer lifetime Silver Elite status to Dividend Mile members who have flown 1,000,000 status miles. To achieve the lifetime status the miles must have been flown on US Airways metal only which means that just like Aeroplan's program, partner flights do not count. US Airways is the second North American Star Alliance carrier to announce this month (Air Canada did so earlier) their participation in the Star Alliance Upgrade Award program. Basically allows you to use miles to upgrade full fare economy or business class flights based on each carriers availability. Less then a week after initially being released, Air Canada has listened to their top flyers and have adjusted some parts of the 2011 Top Tier program due to the numerous complaints they received. The primary changes come in the number of credits required for upgrading certain fare classes with Air Canada lowering the amount in three categories. Thanks to everyone for the comments that have been posted here the last few days, and especially those who took the time to post some very valuable, constructive feedback. While it's not our intent to address every issue raised on this forum on the changes to the 2011 Top Tier program, some very valid points were raised which we agree should be addressed to the best of our ability. These modifications are our attempt to do just that. As I've explained here previously, the eUpgrades program is designed to give our customers more flexibility in terms of what types of fares and flights they would like to use their upgrades on. All credits can now be used to upgrade from Tango Plus and Latitude fares, instead of a system where fixed types of certificates were being offered, which resulted in some customers not being able to fully utilize their upgrade benefit. eUpgrades will allow a customer to choose between using more credits to upgrade lower fares, or less for higher fares. The zone system was developed to take into account the fact that all credits will be valid on all Tango Plus and Latitude fares. We need a simple system to reflect the value of an Executive Class/Executive First seat in a particular market; hence the 1500 miles cutoff within NA and 5000 miles cutoff for International. This one has actually been in the works as the Flight Pass program is independent of both the eUpgrade and Top Tier programs. All Tango Plus Flight Passes that are currently booked in U will be rebooked into M effective Jan 1, 2011 (Passes for flights to our Sun markets are the only ones that are currently outstanding). Existing Flight Pass bookings that are booked in U will be rebooked in M. You will be able to upgrade using your eUpgrade Credits based on the requirement for M class for travel effective March 1, 2011. There is no change to booking windows, which remains the same versus 2010. This change will become effective on the eUpgrades system later this week. The rationale behind the change is that we took another look at all the current M fares across our markets and as some of you have pointed out, the differential between Y/B and M is not always the same. The new revised requirement better reflects the average of the fare differential between M fares and the rest of the Tango Plus fares on our International markets. OK, I know this news is over a week old but better late then never right? Anyways, WestJet has signed another agreement like those previously with Air France KLM, China Airlines and American Airlines whereby customers travelling on British Airways flights from the U.K. connecting to a WestJet flights will be able to do so on a single ticket. "Today (Dec 9) we’re launching the 2011 Air Canada Top Tier Program. We’d like to highlight some of the biggest program enhancements for 2011 right here. As mentioned in earlier communications, eUpgrade Credits can be used for travel starting March 1, 2011. Note that those Top Tier members qualifying in December & January will receive extra 2010 Top Tier upgrade certificates for use for travel through February 28, 2011. Note that these will not and cannot be converted into eUpgrade Credits – they are simply a goodwill gesture for members who would like to upgrade prior to the launch of eUpgrades. Regardless of where your original booking was made, you will always be able to request an upgrade for an eligible flight online at aircanada.com through your eUpgrade account. You’ll also be able to view transaction history. Versus the 2010 upgrade certificate program, there are no major changes to eligible booking classes / booking windows. While the Tango Plus booking class “U” is no longer grouped with booking class “M” (as on our 2010 Top Tier upgrade certificates), this is due to the fact that we are not selling booking class “U” on a regular basis. Beginning with the launch of eUpgrades in the airport on March 1, 2011, all waitlisted upgrade requests will be automatically transferred to our airport standby list. This means that you will no longer have to re-request your upgrade upon check-in if it hasn’t already cleared. Now, all Top Tier members will enjoy the privilege of sharing their credits with eUpgrade Nominees, allowing the nominee to upgrade, even when the member is not traveling with them. However, the sponsoring Top Tier member will always be required to request the upgrade on behalf of their nominee. Just a note that eUpgrade Credits will be deposited into the Top Tier member’s account within 48 hours of choosing eUpgrade Credits as a Select Privilege. Until the account is credited, it will not be possible to access the account, so don’t be concerned if you can’t log into your account immediately. Also, for any December 2010 threshold upgrade activities, we will continue to send paper upgrade certificates. This is due to a system limitation associated with the launch of the eUpgrade program. However, going forward, we will be able to offer credits with a longer validity period for threshold upgrade activities which take place towards the end of a qualification year. For full details on the program (upgrade request process, eligible bookings, credits required, etc), we invite you to visit aircanada.com/eupgrades. We’ll be interested to see your feedback over the coming weeks, especially when the product launches in the airports, for travel on March 1, 2011. Some of you may recall this as a Select Privilege we had a few years ago. We hope it's interesting to Super Elite members who are looking for options other than eUpgrade Credits and/or Bonus Miles. We recognize Maple Leaf Lounge access is valuable to our Prestige members, hence the additional Maple Leaf Lounge One-Time Guest Pass included in one of our Select Privilege options this year. Furthermore, as you may recall from last year, we introduced a 15% Maple Leaf Club discount for all Prestige members, but your feedback made it clear that this was not enough. Therefore, this year we will offer a 35% Maple Leaf Club discount, applicable to all Maple Leaf Club membership options, as a Select Privilege. This is well over double (in some cases triple) the discount offered by other airlines to their equivalent tier members when purchasing lounge membership. In order to better manage the cost of our program, and to ensure that we’re delivering benefits to our true frequent flyers, we have introduced a “minimum flight requirement.” This will be considered during your 2012 Top Tier qualification year (January 1, 2011 through December 31, 2011), so it will not impact your 2011 Top Tier status. The flight requirement is 5 Status Flight Segments or 10,000 Status Miles on eligible flights operated by Air Canada or on behalf of Air Canada by Jazz, Air Georgian Limited (doing business as Air Alliance), Exploits Valley Air Services LTD, Central Mountain Air and Sky Regional Airlines. Note that you can reach the Minimum Flight Requirement on Status Flight Segments, even if you qualify based on Status Miles – or vice versa. You will be able to track your qualification towards this requirement online at aeroplan.com beginning in the spring of 2011. To qualify for Super Elite, you will need 100,000 Status Miles or 95 Status Segments. To qualify for Elite, you will need 35,000 Status Miles or 50 Status Segments. To qualify for Prestige, you will need 25,000 Status Miles or 25 Status Segments. We hope that you’ll be pleased with the changes we’re introducing this year, and as we mentioned last year, we will continue to refine the program based on your comments and ideas going forward." As you can see the biggest change comes in the Upgrade department. Gone are the paper certificates that had to be handed in. Everything will be done electronically with the new eUpgrade credit system. This is where much of the dismay of loyal Air Canada flyers is coming from. Based on the numbers provided by Air Canada on how many eUpgrade credits will be awarded at the various tier levels (of which there are less then last year), members are finding out they are getting fewer upgrades then was seen previously. With the paper system, you had simply provided one certificate for a flight that you cleared the upgrade on (upgrade was either a North American, System wide or Super System wide Upgrade) Now, with the new eUpgrade credits, fare class and flights distance come into play as to how many credits you need to redeem for the upgrade. For example flight from Calgary to Houston will require 2 credits to upgrade a Latitude fare, 4 to 10 credits for Tango Plus. So depending on your route and class, you may have been able to upgrade with one cert in 2010 but may not have enough credits to do the same in 2011. According to some of the posters Flyertalk, the biggest hit in comparison to previous years will come to those using upgrades for flights to Asia. As we reported on Monday, to achieve Top Tier Status for 2012, Aeroplan members will have to complete some flights on Air Canada metal to be eligible for status. A minimum of 10,000 status miles or 5 status flight segments must be flown on AC or on behalf of AC (Air Georgian, Jazz, etc. see above). For the majority of current Top Tier members this is a non-issue as most of their flying is on Air Canada. What this new rule does is make it harder for those who do not fly Air Canada but earn miles and status into the Aeroplan program via partner airlines. Most of these people did it as the Air Canada program was one of the easiest to earn Star Alliance Gold status in (AC Elite Level). In the end how will this affect the number of Top Tier members within Air Canada? I honestly don't think it will affect them significantly. Every year when there has been some sort of devaluation, Air Canada's frequent flyers (the vocal ones at least) state they are taking their business elsewhere but end up staying with AC. Now this may not hold true for all of them as some have jumped ship but overall with Air Canada's position in the Canadian market, it is hard for frequent flyers to move to another program when in reality there are only two players in the domestic market, and the other player WestJet, has no business class to upgrade to or partner airlines to redeem miles on. So unless WestJet changes their business model and/or Air Canada actually sees a mass exodus of premium travellers, this yearly occurance of Air Canada annoucing the Top Tier benefits and the frequent flyers complaining will not change as Air Canada has a loose stranglehold on the premium market and the loyalty surronding it..
To read what some Air Canada frequent flyers are saying and some responses from Air Canada please see this thread on Flyer Talk and this thread on Canflyer. As always feel free to comment below! A new development in the ongoing quest of achieving top tier status with Aeroplan for 2011 will be the requirement of actually flying on Air Canada. Up to now, one could fly any Star Alliance airline and post all the status miles to Air Canada to achieve top tier status with Air Canada/Aeroplan. This meant that they may have never set foot on an Air Canada plane yet Air Canada/Aeroplan had to provide that frequent flyer with status. In particular, the Elite Status level is what many non-Air Canada flyers looked for when posting miles to Aeroplan as you only required 35,000 status miles to get the Elite Status and in turn that status gave them Star Alliance Gold status while an airline like United required 50,000 status miles to get the same Star Alliance Gold status. Fast forward to 2011 and the new rules state that you must fly either 10,000 status miles or 5 eligible status flight segments as part of the qualifying process to achieve Air Canada 2012 Top Tier status (Prestige, Elite and Super Elite). At this point, the complete qualifying criteria has not been released by Air Canada but we can assume it will be the same as the past couple of years where total status miles and/or segments required was 25,000 miles or 25 segments for Prestige, 35,000 miles or 50 segments for Elite and 100,000 miles or 95 segments for Super Elite. For more details and discussion from many Air Canada frequent flyers please see this post on Flyertalk. Air Canada is now officially participating in the Star Alliance Upgrade Awards program which allows members from Aeroplan and other Star Alliance programs to use their miles to upgrade on eligible Air Canada and Jazz Flights. The upgrades only work on Latitude fares (Economy Y or B booking class) and can be requested right as soon as your booking is confirmed. See Aeroplan's Star Alliance Upgrade Page for more details. For a complete roundup of all the details and pages related to this latest feature with Aeroplan and to process upgrade requests online see this summary page on Aeroplan. On Saturday December 4, Rexall Stores will be offering Aeroplan Members 15,000 Bonus Aeroplan miles for simplying transferring a prescription from a non-Rexall/Pharma-Plus drug store and filling the prescription right away. The offer is valid at participating Rexall/Rexall Pharma Plus locations only in the provinces of British Columbia, Alberta, Saskatchewan, North West Territories and Manitoba. Depending on the cost of your prescription you can get a pretty cheap short haul flight out of this deal (15,000 Aeroplan Miles = 1 Short Haul flight). You can expect many Rexalls particularily in the bigger metropolitan centers to be quite busy so get there earliy to take advantage of the offer. WestJet announced last week that they will be adding direct non-stop flights from Halifax to Montego Bay, Punta Cana, Fort Lauderdale and Tampa and expanding service to Cancun and Orlando. All the new and expanded routes will be flown once per week and are seasonal for Winter 2011. They are all starting mid-February and running until early May. Egyptair annouced last week at the African Airlines Association general assembly that they will be launching a new service between Toronto and Cairo, Egypt. The new service has now been loaded into the GDS systems (per Airline Route Updates) and will commence on Jun 1, 2011. The flight will be operated with a Boeing 777-300ER on a 3x weekly basis. Richest Credit Card sign up bonus ever to be offered in Canada? I just received an email from Aeroplan for the American Express AeroplanPlus Platinum Card. Normally I just quickly look it over if anything has changed on the card since it was introduced 4 or so years agoand then delete it. But this time, the email really caught my eye. Why? They are offering 50,000 Bonus Aeroplan miles to new applicants for the card. You get 25,000 upon the first use of your card and 25,000 when you spend $1,000 within the first three months. In my history of tracking reward programs I have never seen a credit card bonus offer this high in Canada. In the U.S., sure you had the British Airways 100,000 BA Miles credit card offer and the American Airlines 75,000 AAdvantage mile offer but here in Canada, the highest sign up bonus in recent history came from the Capital One Aspire World MasterCard with 35,000 bonus miles! The AeroplanPlus platinum card is not for everyone as it comes with a hefty annual fee of $499 but for the frequent traveller (or even relatively frequent) the annual fee can pay for itself with free access to business class lounges, priority check in, a yearly short haul companion ticket, increased earning of 1.25 to 1.5 Aeroplan miles on all spending and other typical features seen on premium cards. This offer of 50,000 miles is valid for new applications made up to December 28, 2010. Now, the question to ask is whether other card issuers in Canada will follow. We have seen the trend in the U.S. with increased card offerings as most credit cards there are now offering a minimum of 30,000 miles or points with quite a few in the 50,000 mile/point range. I know many frequent travellers here in Canada who have complained about the paltry sign up bonuses along with annual fees more then double that of our counterparts to the South. So lets keep our fingers crossed that this is the start of hefty....I mean healthy trend of increased sign up bonuses in Canada. Receive $100 off of Premium Voyageur (premium economy) flight reservations over $1000 departing from Montreal, Toronto and Ottawa to any Air France destination that offers a Premium Voyageur fare. Use promo code AFFPV891. Travel must be between December 1st 2010 and April 30th, 2011 with the latest return being August 31st, 2011. Great news! We've improved the search engine of our online booking tool to show you better-quality Star Alliance flight reward options to transborder USA and international destinations. In other words, greater access to the 27 Star Alliance member airlines. The bottom line: Getting to your destination is now easier. Use our new and improved online booking for a chance to win 25,000 miles. Only until December 15! To celebrate the launch of their upcoming new route between Toronto and Beijing, China's Hainan Airlines is offering members of its Fortune Wings program up to 24,000 Bonus Fortune Wings miles for flying the route. My partner in Rewards Canada and the Frequent Flyer Bonuses Group (who also happens to be my wife) has launched her own blog called My Paper Crown which focuses on her lifestyle passions of home design, fashion, and great recipes! Having been with her for 13 years I know that she knows these topics extremely well and the blog is her way of sharing her passion with the masses. She is not one to keep great things a secret so when she finds something new (or old) that she likes, I am sure you'll find on her blog right away. If these topics are of interest to you, your significant other or friends and coworkers please tell them and check it out today! You may recall our post from last week annoucing WestJet's decision to start charging $20 second checked bag fee and although we had hoped that Air Canada would not follow suit we figured they would. Well, on a late afternoon press release the night before a holiday (I'm guessing this was not a coincidence), Air Canada announced that they will follow in WestJet's footsteps and a second bag fee on their Canadain routes as well as routes to Mexico and the Caribbean. Air Canada already charges a second bag fee on routes to the U.S. and Europe so there is no change there. Just like WestJet, the new fee goes into effect on travel from January 19 on any tickets that are purchased on or after November 11. According to this thread on FlyerTalk, Air Canada's Super Elite members will finally be able to receive and use eUpgrade certificates rather then the paper certificates that they have all become accustomed to. The notice comes from an email that the Super Elite's have received from Air Canada and it states that this new feature will be live in December 2011 for the members to manage upgrades for flights starting March 1, 2011. All the details are to be released in conjuction with the 2011 Top Tier program announcement in the next few weeks. Of course we will keep you up to date on this enhancement and on the 2011 Top Tier program as we have done so in past years. So please check back regularly! In a surprise move that countered most of WestJet's marketing strategies for the past year and a half or so, the airline announced yesterday that they will begin charging $20 for the second checked bag on flights on or after Jan 19, 2011. The first checked bag for each customer remains free. The fee is effective on all tickets purchased on or after Nov 3, 10. The $20 fee is applicable to all of WestJet's routes and like any airline who adds a new fee, it has irked many travellers as can be seen by the responses on WestJet's social media channels like Facebook and Twitter. Most airlines in North America are now charging some sort of baggage fee (most U.S. airlines charge for the first and/or second bags with Southwest being a exception) however WestJet's primary competitor, Air Canada only charges a second bag fee on flights to the U.S. and Europe. Within Canada, Air Canada still allows 2 checked bags for free, at least for the time being. We all know that the airlines tend to follow in each others footsteps so we may see Air Canada start charging for a second checked bag within Canada soon. If I was Air Canada I would avoid this to appease the customers especially since Air Canada seems to be gaining momentum in the customer service department and more people are enjoying their in flight service as of late. Perhaps Air Canada's marketing department will put a positive spin on WestJet's news for their airline. However, in the long run, if your primary competitor is adding to their bottom line with ancillary revenues derived from baggage fees on flights in Canada, why would you not do the same? Once again we have teamed up with Hyatt Hotels for another quick contest on the Frequent Flyer Bonuses blog. This time we are giving away 2 prizes of 10,000 Gold Passport Points for commenting on some Hyatt Itineraries. The contest runs until Nov 10, 10. Check it out and participate if you like. A long time Northwest Airlines city, London ON, will see its service cut this winter season due to poor performance. This will be the second city in Ontario that has been cut since Delta's merger with Northwest. This route has not been around very long (well this reincarnation of it) and according to Airline Route Updates the last flight between Toronto and Orange County will be on Oct 29. According to Airline Route Updates, AeroMexico will return to the Canadian market with scheduled service between Montreal and Mexico City. The daily flights will resume on Dec 15. This is part 3 of a 3 part series on the American Express Gold Rewards Card sees me give the card the full on Rewards Canada review process! As you may recall, American Express has asked me to test drive this new card and in return they offered me 50,000 points to experience the earning and redemption process with the card. This is first time we have been able to do a review on a card while we have actually used it and not just on what the card claims on paper. Below you will find the complete review of the card as seen on the main Rewards Canada site. At the beginning of October American Express Canada re-launched their American Express Gold Rewards Card. This reincarnation of American Express' flagship charge card takes the best features of its competitors and puts them into one package. The card falls into the hybrid travel rewards card category which means you have the option of using the points for any travel booking or you can choose to convert the points to frequent flyer miles and frequent guest points. The American Express Gold Rewards Card provides an excellent insurance and benefit package that is similar to its primary competitors. The card features a good earning ratio that meets and in some cases exceeds other hybrid and travel points cards like TD's First Class Infinite Visa and RBC Infinite Visa Avion because of the double points earned on certain everyday spending. It has an industry average sign up bonus and is fee free for the primary and all supplementary cards in the first year. The American Express Gold Rewards Card comes with a $150 primary card annual fee that may seem higher then its competitors but the first supplementary card is free in comparison to the $50 or so seen on other cards. A nice benefit is that the $150 annual fee is waived in the first year of membership. The card offers a 15,000 Membership Rewards point welcome bonus when the new Cardmember spends $500 in the first three months. Additional cards over and above the first free one are $50 (although once again this fee is waived in the first year) which is roughly the same as many of the card's competitors. Since the Gold Rewards Card is a charge card it technically does not have an interest rate like its credit card competitors but should the cardholder miss a payment or not pay off the balance American Express charges a 30% non-revolving annual interest rate. The American Express Gold Rewards Card earns 2 Membership Rewards points for every dollar spent on the card for travel, grocery, drugstore and gas station purchases. For all other purchases the card earns 1 Membership Rewards point per dollar spent. On the redemption side, the Membership Rewards points earned with the American Express Gold Rewards Card can be redeemed for any travel from any provider or they can be converted to frequent flyer miles and frequent guest points. The first option which American Express calls TripFlex, allows the Cardmember to book any travel from any provider they want, be it a travel agency, online booking engine or directly from an airline, hotel, train, car rental company and more and then call Amex to redeem their Membership Rewards points against the charge on their statement. The rate of redemption for the TripFlex option is 1,000 points for a $10 credit with a minimum redemption of 1,000 points. Cardmembers have up to 12 months from the date of travel purchase to redeem points and can use them to pay for only part of the purchase should they choose. The second option of this hybrid card is to convert the Membership Rewards points for frequent flyer miles or frequent guest points. For most Canadians their primary frequent flyer program is Aeroplan and this card offers a 1 to 1 redemption rate on conversions to Aeroplan. Other airlines offered are Alitalia MilleMiglia, British Airways Executive Club, Cathay Pacific Asia Miles, and Delta SkyMiles. For all of these other airlines 1,000 Membership Rewards points will net 750 miles in the respective program. For hotel programs, Cardmembers can convert to three frequent guest programs: InterContinental Hotels Priority Club (1,000 MR points = 800 Priority Club points), Hilton HHonors (1,000 MR points = 900 HHonors points) and Starwood Preferred Guest (1,000 MR points = 500 Star points). Beyond these two main redemption options Membership Rewards points can also be redeemed for American Express Travellers Cheques, gift cards and merchandise. The card also American Express' Front of the Line Service which provides advanced ticket and reserved ticket access to some of Canada's most popular events. The earning ability of 2 points per dollar for travel, gas, grocery and drug store spend means that cardmembers, particularly those who travel a lot, will be able to earn points at a much faster rate then many of this card’s competitors. Being totally fee free the first year is a nice perk and by not charging for the first supplementary card each year thereafter actually makes this card cheaper to own over other cards. With a one to one redemption to Aeroplan, the card is also one of the highest earning Aeroplan cards on the market when you take into account the 2 points per dollar feature. A good insurance and benefit package means the cardholder is well covered when travelling in Canada or abroad. There are only a couple of minor details which may keep some people from getting this card. The first is that it is a charge card, for anyone who runs a balance, this card is not for them as the balance has to be paid off every month. Second, some may say that American Express is not widely accepted like its competitors and while this may be true the current trend has more and more merchants accepting American Express everyday. Third, for some people who travel a lot, the lack of Trip Cancellation insurance may push them to a card that offers this benefit and the peace of mind should they get sick, have a death in the family or lose their employment. By combining the best features from many of its competitors, the American Express Gold Rewards Card as a whole is a great card. I have had the card in my wallet for a little over two weeks at the time of writing and have used the card quite a bit, particularly on gas and grocery spending and plan on continuing to use it as it will replace my American Express Blue Sky credit card. The card will definitely shake up our Top Travel Rewards Credit Card rankings for 2011 in the Hybrid card category. The higher earning ability, the vast redemption options including the ability to book travel yourself and a nice benefit package make this an above average card in the Canadian travel rewards credit card market. Effective October 18, 2010, customers on board all Air Canada and Jazz operated flights will be permitted to use their handheld electronic devices, such as cellular phones, Blackberries and smart phones during the taxi-in to the gate after the aircraft has turned off the active runway. The handheld electronic devices must be retrieved prior to landing as all carry on bags must be stowed until the seat belt sign is turned off at the gate. Flight attendants will advise customers when mobile phones can be used after arrival. FORT WORTH, TX, Oct. 19 /CNW/ - American Airlines and WestJet Airlines announced today they have entered into an interline agreement. The interline agreement means American Airlines customers travelling to Canada and transferring to a WestJet flight can purchase a single ticket and check bags through to their final destination. The agreement provides American's customers seamless connecting service to 25 new Canadian cities not currently served by American or American Eagle. WestJet serves a total of 31 Canadian cities and 71 destinations in 13 countries. The connections will first be available through the six gateways in Canada currently served by American or American Eagle - Toronto, Montreal, Calgary, Vancouver, Halifax and Ottawa. American and WestJet expect to implement a second phase of their interline relationship in December that will add additional connecting opportunities through WestJet's non-stop U.S. flights to Canadian cities. "American's interline agreement with WestJet complements our North American network and greatly benefits our customers by offering additional connections to and from new Canadian markets," said Virasb Vahidi, American's Chief Commercial Officer. "WestJet offers a high-quality on-board product that our customers will enjoy." "This agreement represents WestJet's first interline with a U.S. carrier and we are excited to be working with such a well-established and recognized global airline like American Airlines," said Hugh Dunleavy, WestJet's Executive Vice-President, Strategy and Planning. "We look forward to welcoming the many American customers on board our aircraft as guests who will experience WestJet's world-class guest experience." The interline connecting itineraries will be available for booking on American's award-winning AA.com website, as well as through travel agencies and American Airlines Reservations, effective Nov. 9, 2010. The companies also said they are exploring other ways to enhance customer benefits through other commercial co-operation agreements. I spent the majority of this past week in Montreal attending the Airline Information 2010 Mega Event and the 1st Annual Mega Awards which I was honored to be a judge for. The conference itself was extremely well attended with nearly double the number of people over last years Mega Event in Huntington Beach. From airline execs to technology vendors the 3 days of networking, workshops, panels and the awards were a resounding success for the boys from Airline Information. One of the highlights of the Mega Event was of course the Mega Awards which were hosted by Freddie Laker Jr. The Mega Awards recognized marketing campaign excellence in 2009 by airlines, vendors and professionals in the areas Loyalty, Social Media and Ancillary revenue. The awards gala was pretty much sold out and Freddie Laker Jr. (with his marketing background and of course airline heritage from his father) made the perfect host for the evening. I look forward to next year's awards as 2010 has been another great year so far for the various marketing campaigns run by airlines, vendors and professionals. This is the second blog post of my three part series on the new American Express Gold Rewards Card that was introduced to the Canadian market at the start of this month. As mentioned in my first post, American Express has asked me to test drive this new card and in return they offered me 50,000 points to experience the earning and redemption process with the card. One of the main things I have found valuable about the card is the ease and value of the Membership Rewards points earned. A large portion of my credit card spend is on everyday purchases at gas stations and grocery stores which have the accelerated earning of 2 points per dollar. A recent Angus Reid survey revealed that 24% of Canadians spend $10,000 and $15,000 per year on Gas Stations, Grocery and drugstore purchases which all fall under the earning ratio of 2 points per dollar with the Gold Rewards Card. For me this earn ratio will allow me to rack up a lot of points over and above what American Express awarded me for trying the card, allowing for a greater redemption. Add to this the 2 points per dollar on all travel purchases which according to the survey fits in nicely with the 89% of Canadians who take one or more vacations a year. Another plus of using the TripFlex option is that I don’t have to have all the points at the time of booking and continue to collect for the trip after I book. In fact holders of the Gold Rewards Card actually have up to 12 months after the travel booking is posted to their account to redeem points against the charge. This restriction-free redemption is not only important to me but it is the most important factor that Canadian consumers look for when choosing a rewards program according to the Angus Reid survey. Over and above all of this, I will earn double points on the vacation purchase and can continue to earn points on my everyday spend on the Gold Rewards Card and then redeem those points towards this vacation to bring the cost down even more. Should I choose, I don’t have to redeem these extra points on the travel and save them up for future travel like nearly a quarter of Canadians who keep banking their miles and points. One thing members of other rewards programs may have to watch for is miles or points expiry but with the Membership Rewards Program this is not an issue as the points never expire. I am going to continue to use this card up to my third blog post and more then likely will continue to use it after as it will replace my American Express Blue Sky Credit Card (another very good travel rewards card). The third blog post will be a complete review of the credit card in the typical Rewards Canada fashion that we have used since the start of this year. This past week saw the official announcement of a code sharing agreement between Cathay Pacific and WestJet which will further solidifies the relationship that these carriers have had with each other. As of October 20th, Cathay Pacific will out their code (ie own flight number) on numerous WestJet flights that connect to the two cities that Cathay flies to: Vancouver and Toronto. The cities that Cathay will 'serve' now with this agreement include Calgary, Edmonton, Halifax, Montreal, Ottawa and Winnipeg. They will also codeshare on some of WestJet's flights between Toronto and Vancouver. MONTREAL, Oct. 4 /CNW Telbec/ - Air Canada today announced that it has settled the terms of a long term Commercial Carrier Operating Agreement (CCOA) with the Toronto Port Authority (TPA), operator of Billy Bishop Toronto City Airport. Conclusion of the agreement is subject to certain conditions, including agreement with the lessor of terminal space, City Centre Terminal Corp. (CCTC), for lease of space at the airport. In addition, the airline has entered into a letter of intent for the leasing of aircraft and has finalized arrangements with a regional carrier to operate flights from the Toronto Island airport beginning in February 2011. Air Canada's initial schedule will offer customers the choice of up to 15 daily non-stop flights from Billy Bishop Toronto City Airport, in close proximity to downtown Toronto, to Montreal Trudeau International Airport. "We are very excited to return to Toronto City Airport in the coming months," said Ben Smith, Executive Vice President and Chief Commercial Officer. "These arrangements mark solid progress as we work to develop a unique product tailored to meet the diverse needs of travelers between Canada's two largest cities. Our customers have told us they want an airport option close to downtown Toronto to complement our Rapidair service which offers flights up to every 30 minutes at peak times." Flights will be operated with Bombardier Dash 8 Q400 turboprop aircraft. Air Canada has signed a letter of intent with a lessor for the five aircraft that will be operated on the Toronto City Airport-Montreal route. Formal terms and conditions of the lease agreements are expected to be finalized in the coming weeks. Following a competitive bid process to select a Canadian regional operator for these aircraft, Air Canada has concluded a capacity purchase agreement with Sky Regional Airlines Inc., an associated company of Skyservice Business Aviation. The regional carrier will sublease and operate the Dash 8 Q400 aircraft on behalf of Air Canada. Selection of Sky Regional Airlines was based on a number of criteria including a competitive cost structure, a proven track record in customer service excellence and experience maintaining Dash 8 Q400 aircraft. The selection of Sky Regional Airlines to operate these flights has no impact on Air Canada's commercial arrangements with other regional carriers including Jazz Air LP with which Air Canada maintains a strong commercial relationship. Over the past few years the trend with many airline frequent flyer programs has been to reduce the amount of miles earned on discount economy fares. Whether it was Aeroplan, Miles and More, Executive Club or any host of other programs, the move to awarding less miles was to cut costs associated with the low margin discount fares. Some airlines only did it on domestic fares (ie Air Canada) while others like British Airways had it across the board. Well, BA has made an about face and has decided once again to offer 100% of the mileage flown on discount economy fares for their Blue Executive Club members (non-status members). Previously, they were only awarding 25% of the mileage flown. They have also increased the amount of elite qualifying tier points from 25% to 50% on the same fares. In this day and age it is tough to find an airline giving back to the conusmer due to low margins but this is nice move on BA's part and hopefully some of the other carriers will follow suit. Enhancements to AIR MILES Flight Rewards now live. You may recall our post on August 31 outlining changes to the flight rewards portion of the AIR MILES program that were due to come out soon. Well that time has come (last week actually), as the enhancements to the program that were announced are now live. Members can finally book flights online at airmiles.ca, they can book one way flights (at roughly 60% of the roundtrip cost, comparable to Aeroplan), they have access to 25 more airlines and more seats on partner airlines for additional reward miles and the ability to book travel for flights outside of Canada (eg London, UK to Paris). As you may have read in an earlier blog post of mine, I have partnered with American Express to test drive their new Gold Rewards Card that launched October 1 in the Canadian market. The task for me will be to blog about this card over the next three weeks and give my professional opinion on the card while I use it. What do I get in return? American Express will be awarding me with 50,000 Membership Rewards points so that I can actually experience the booking or point transfer process with American Express Membership Rewards. The card itself was introduced to me and other social media practitioners at a dinner held at the Canadian Air & Space Museum in Toronto. The team from American Express were very excited about the new Card launch and I have to admit that after hearing all the details, the Card is a very good offering in the competitive travel rewards Credit Card market. For us here at Rewards Canada, the card falls into the Hybrid Card category as you have the option of converting points to frequent flyer/guest miles or to use the points for any type of travel booked via any travel agency, online or tour operator for example. Unless other Cards change by next July, this Card will shake up the ranks in this category for our annual Credit Card ranking. The Card itself is a Charge Card, meaning that it has no preset credit limit but the balance must be paid off in full each month. The benefit of a Charge Card is that requires Cardmembers to be disciplined about their spending and typically Charge Card holders do not spend more then they can afford. What does the Card offer? To start, it will award 15,000 Bonus reward points once the Cardmember spends $500 on the card in the first three months and the first year annual fee is waived (thereafter it is $150) plus the first supplementary card is free for life. Additional supplementary cards are $50 per year, although this is also waived in the first year. The card earns 2 points per dollar spent at Gas Stations, Grocery, Drug stores and all travel, 1 point per dollar on all other spending. Those points can be redeemed for travel, merchandise and entertainment rewards via the Membership Rewards program. Where will I go with the points that American Express has given me? Well, I haven’t decided yet, but my family and I have been talking about going to Caribbean in January and will more than likely put the points towards that. How will I use the points? I have two options, I can convert the 50,000 Membership Rewards points to 50,000 Aeroplan Miles to top off my Aeroplan account and book the flights via Aeroplan and the hotel separately or I may book a packaged all inclusive vacation and use the TripFlex option to provide a $500 credit to the overall booking cost. Assuming I have spent some money on the card, I should have more points available to further bring down the cost of the vacation. * Up to 3,000 Bonus Aeroplan Miles on select routes within Canada or between Canada and the U.S.
plus Fly 3 eligible one-way flight segments in Latitude or Executive First between Canada and Europe or Asia, and you’ll receive an additional one-time 15,000 mile bonus! The promotion is open to all Aeroplan members who register for the offer and is valid for flights until December 15. Air Canada's Aeroplan will no longer be partnered with China's Shanghai Airlines as of October 31. That is the last day Aeroplan members will be able to earn miles on Shanghai Airlines while October 28 will be the last day members can redeem Aeroplan miles for Shanghai Airlines flights. Redemptions can be made for travel that is completed by October 31, 11. If you do redeem for flights on Shanghai Airlines be warned that no changes can be made to those reward tickets after October 28, 10. Rewards Canada is 9 years old! Rewards Canada quietly turned 9 years old this month! In some ways I cannot believe that Rewards Canada and our other websites have grown into what they have become today. When Rewards Canada was launched in 2001 it started off as a hobby and today it is part a full fledged global business providing travel rewards knowledge, consulting and promotion to consumers and corporations alike. Without our readers, visitors and clients we would not be where we are today, so I want to thank all of you for your continued support over the last 9 years and look forward to providing you with the latest on travel rewards for the next 9! This new version of the Gold Rewards Card basically takes some of the best features of many of its competitors and puts them into one complete package. It falls into our Hybrid Credit Card category as it allows you to either transfer points to frequent flyer and guest programs or allows you to book travel however you want and redeem the points against the charge. First impressions of the card make it a top contender in this category and will more then likely shake up the ranks. I have been asked by American Express to "test-drive" this new Gold Rewards for the next month or so and will provide some progress reports on how the card stacks up. We will provide our complete Rewards Canada review of the card in the coming weeks much like we have done so for other new cards that came out this year. For more details see the release below from American Express, plus stayed tuned to our blog and website for all the updates and reviews. Life’s just golden when the answer is ‘yes.’ With the new American Express® Gold Rewards Card – an entirely new concept in rewards designed with the consumer in mind – Cardmembers earn double Membership Rewards® points on eligible gas, grocery and drugstore purchases, as well as on eligible travel purchases charged to the Card, including flights, hotels, car rentals, cruises and packages. They also earn one point for every dollar in purchases everywhere else – no matter where in the world their journeys take them. What’s more, there’s no cap on the number of points Cardmembers can earn, and points never expire. What are Membership Rewards® points? With the American Express Gold Rewards Card, the points Cardmembers earn are called Membership Rewards points. These points can be redeemed for travel, top-brand merchandise and entertainment rewards from over 500 major brands. Points can be redeemed to pay for any travel Cardmembers book, whether it be online or through a travel agent or tour provider. Once travel has been charged to the Card, Cardmembers can pay with points and will not be subject to blackouts. There is also the option to transfer points into other programs. With TripFlex rewards, Cardmembers have ultimate travel flexibility with their points, allowing them to fulfill their travel dreams. They can charge ANY travel on their Card, including last-minute fares and seat sales – with any provider. After the charge has been posted to their account, Cardmembers simply call American Express at the number on the back of their Card to use their points to cover the charge – including fees and taxes too. They can redeem their points starting at 1,000 points for a $10 statement credit, up to the full amount of the travel purchase – the choice is theirs. The amazing part of TripFlex rewards is that you don’t need to have enough points for your reward at the time of booking - as you have up to 12 months to redeem your points for your trip. That means that you can purchase your travel on your Card, enjoy your vacation, earn more points, and then up to 12 months from the date the travel purchases was posted to your account, redeem your points for that vacation. Cardmembers can also choose to transfer points instantly one-to-one to Aeroplan or to frequent flyer and hotel programs, including: Alitalia, British Airways, Delta, Cathay Pacific, Hilton Honors, Starwood Preferred Guest, and Priority Club. Transfers from Membership Rewards allow Cardmembers to take advantage of another program to get the reward they want. 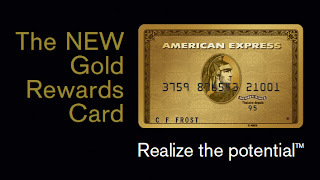 Points will add up quickly with the rich earning formula on the American Express Gold Rewards Card. Cardmembers will earn double points on eligible travel purchases and also on eligible gas, grocery and drugstore purchases. Additionally, they will earn one point for every $1 in Card purchases everywhere else. See the world, on your terms. The American Express Gold Rewards Card is also a smart financial management tool for consumers. As a Charge Card, it offers the convenience of paying with plastic but without carrying a balance and paying interest. This gives Cardmembers the flexibility and spending power they need, as well as a rich rewards program and a robust set of benefits. • Front Of The Line (gives Cardmembers access to some of Canada’s hottest concerts, theatre productions and special events before the general public). A new era in rewards is just around the corner with the upcoming launch of the American Express Gold Rewards Card! If you have questions in the meantime, please don’t hesitate to contact us. We hope you enjoyed this sneak peak at the new American Express Gold Rewards Card. A full breakdown of the Card and all its details are soon to come!" It finally became official a little over a week ago, Ritz-Carlton has succumbed to the pressures of the industry by launching their own frequent guest program: Ritz-Carlton Rewards. It is closely tied to Ritz's parent company's Marriott Rewards program with both programs having reciprocating earning and burning benefits at each others hotels. The Ritz-Carlton Rewards program will give members 10 Rewards points or 2 airline miles for every US$1 spent on your room rate at Ritz-Carlton locations Worldwide. Unfortunately they will not award points at this time on other spending that is put onto your room bill. Members will also earn points or miles for stays at the 11 brands in the Marriott hotel family. Points can also be earned on hosting events at Ritz-Carlton locations, on Abercrombie & Kent packages that include a Ritz-Carlton stay and on cruise bookings made through LuxuryOnly. On the redemption side, Ritz-Carlton Rewards members can use their points for stays at Ritz-Carlton and the Marriott family of hotels worldwide. Free nights at Ritz-Carlton locations start at 30,000 points. Points Saver nights are available as well starting at 20,000 points for select locations at select times. If members redeem for five nights at once, the fifth night is free. The points can also be used for room upgrades at select Ritz-Carlton hotels starting at 5,000 points per night. Other redemption options include points to frequent flyer miles, travel packages, luxury cruises and retail partners like Neiman Marcus. Much like most frequent travel programs, the Ritz-Carlton Rewards program offer elite tier levels. The Silver elite level is awarded after 10 eligible nights, Gold after 50 and Platinum after 75 nights. Depending on the level, the benefits from the tier programs range from bonus points and late check out all the way to complimentary room upgrades and arrival gifts. As well, watch for a dedicated page on Rewards Canada for Ritz-Carlton Rewards Bonus Point Opportunities to be launched within the next week or so! Not exactly a mileage offer but some might consider this a "Frequent Flyer Bonus" as American Airlines moves to stop charging for most alcoholic beverages in their domestic Admiral Club lounges. The new policy starts on October 1st and covers well brand liquors, beer and house wines. There will however remain a charge for premium liquors and wines as well as the variety of food options that tend to be available. On the same day that Ritz-Carlton launched their new rewards program (this will be covered in another post) that is closely tied to Marriott, members of the Marriott Rewards program can now earn and redeem Marriott Rewards points at Ritz-Carlton, Autograph Collection and EDITION Hotels. This new opportunity for Marriott Rewards members is obviously part of the reciprocity of the two hotel loyalty programs working together. Per Airline Route Updates, China's Hainan Airlines will launch three times weekly service between Toronto and Beijing on Nov 27. The route will be operated with an Airbus A340-600. Frequent travellers can earn miles for the flight in Hainan's Fortune Wings Club or on their partner airlines like Air Berlin's Top Bonus and Malev's Duna Club to name a few. This is the review in full as it appears on the main Rewards Canada site. The latest travel rewards credit card to be released in Canada is the Delta SkyMiles® World MasterCard® from Capital One. Delta has been looking to release a credit card in Canada over the past couple years, initial reports had BMO being the card partner but now we all know that Capital One is the banking partner for Delta. This card is the first airline card for the SkyTeam alliance in Canada and Delta is only the fourth US airline to have a dedicated card in Canada after Alaska, American and United. It is primarily targeted to existing SkyMiles members in Canada but Capital One and Delta are also looking to potentially move some people away from other frequent flyer programs in Canada to their offering. Seeing that the Delta SkyMiles® World MasterCard® from Capital One comes with MasterCard's 'World' branding, therefore it provides an excellent insurance and benefit package that is similar to Capital One's Aspire World MasterCard. The card features a good earning ratio that eclipses other airline cards like RBC's British Airways and Cathay Pacific Visas in that you technically get triple miles when you book with the airline. It has a decent sign up bonus, and allows you to add an authorized user for $0. The Delta SkyMiles® World MasterCard® from Capital One comes with a standard $120 primary card annual fee that you will find on most premium cards that offer similar rewards and benefits. Get a welcome bonus of up to 25,000 Delta miles. Depending on time, season and availability, the sign up offer could be worth upwards of $500-$600 in equivalent flight costs. The interest rate on the card is 19.8% placing it right in the middle of the pack of competitors. Please Note: A requirement of this card is a minimum personal income of $60,000 or household income of $100,000. The Delta SkyMiles® World MasterCard® from Capital One earns 3 Delta miles for every $1 you spend on Delta purchases. Earn 2 Delta miles per $1 on all other net purchases. The card features a 10,000 bonus Delta miles on your account anniversary if you spend at least $25,000 in net purchases each membership year. As stated above the Delta SkyMiles® World MasterCard® from Capital One comes with an insurance package that competes with all the other high end cards. The card features Trip Cancellation Insurance which is only offered as a standard feature on five other travel rewards cards and Travel Medical insurance which only comes standard on about 50% of the cards in the market. For the loyal Delta/SkyMiles traveler or frequent flyer, this card is a perfect fit to add many more miles to their SkyMiles account. The sign up bonus of 25,000 miles is higher then most other airline cards in Canada. The ability to redeem for business or first class seats at a good rate of return (these premium class redemptions can sometimes give as high as a 10% return on your spending) is always a plus feature to card like this. The airlines partnered with Delta, in particular the SkyTeam airlines, means you don't always have to transit the U.S. on your reward flights as some partners fly directly from Canada to Asia and Europe. Add the whole host of insurance and benefits including the trip cancellation and Travel Emergency Medical and you have a decent offering for an airline credit card. As with virtually every frequent flyer program, the biggest drawback continues to be award availability, particularly at the lowest redemption levels that a program has. Delta SkyMiles is not immune to this as we mentioned above although unlike some frequent flyer programs you at least have access to all seats and not select few per flight even if it may cost you more miles. The additional taxes and fees on reward flights can also be seen as a drawback compared to the many travel points cards in Canada that allow you to use points towards the taxes and fees. Finally, flight redemptions via SkyMiles cannot be used for flights within Canada as Delta does not have a domestic partner, all flights would have to go via the U.S. and have to be booked as separate one way or multi-segment trips. While the Delta SkyMiles® World MasterCard® from Capital One won't stir up the Canadian market like Capital One's Aspire card did earlier this year it does present a viable option for a dedicated airline credit card in Canada. Having a nice sign up bonus, a good insurance package and being part of the second largest airline alliance serving Canada, the card will be attractive to frequent travelers whose primary travels take them outside of Canada. It will not make a big dent in Aeroplan's or AIR MILES' customer bases but it will definitely keep many of the current SkyMiles members from defecting to another program if they have been considering a move. We would like to hear your thoughts on the new Delta SkyMiles® World MasterCard® from Capital One by commenting below! I am proud to announce that I will be one of the five members of the Judging academy for the 2010 Mega Awards to be held in Montreal on Oct 13, 2010 which is part of the larger Mega Event 2010 (FFP | ARAC | Co-Brand): The Airline Profitability Summit which runs Oct 12-14. (son of legendary low cost airline innovator Sir Freddie Laker). Winners of the Mega Award will be recognized during a ceremony held at Mega Event in Montreal on 13 October. An elegant gala evening featuring cocktails, dinner and a special appearance by modern low cost innovator Tony Fernandes, will mark Airline Information’s return to industry accolades since the FFP Innovation Awards. This is truly an event that you don’t want to miss! What are the Mega Awards? Mega Awards can be won by Airlines, Vendors, and Professionals in three categories. Categories include: Loyalty Marketing, Customer Engagement through Social Media, Merchandising/Ancillary Revenue. For the 2010 awards, both Vendors and Professionals are limited to the Loyalty Marketing and Merchandising categories. The honor of winning a Mega Award requires daring innovation and results-oriented marketing. Campaigns launched or executed in the calendar year 2009 will be up for consideration by the Mega Awards Judging Academy. " I am excited to be selected to be part of the judging panel and look forward to evaluating all the entries that are received. If you are attending the summit or the gala or both, feel free to contact me so that we can have chance to meet face to face in Montreal. Air Canada announced yesterday that they will restart daily Montreal to Mexico City service and initiate new service between Vancouver and Mexico City this fall. This announcement comes on the heels of Mexicana Airlines demise over the past weekend and also follows Japan Airlines pulling out of the Vancouver-Mexico City market awhile back.